Toronto Dogs Directory: Things That Make Me Go Grrrrr.....Is One Woman Withholding A Dog From A Terminally Ill Child? Things That Make Me Go Grrrrr.....Is One Woman Withholding A Dog From A Terminally Ill Child? Truth be told, Christmas isn't even here yet & I'm over it. Sure I enjoy the egg nog, the parties, and seeing loved ones but in the grand scheme of things it's just another few dates on the calendar that pass quickly before we all return to our regular routine. I don't even partake in the family gift draw anymore though I do make one exception and every year I get my niece & nephew something that is awesome. Why? Because above all things, Christmas is for kids! Unfortunately for one little Sacramento girl named Tiffany the holiday is shaping up to be anything but joyous. Tiffany is terminal with cancer and her one wish is to have a Pug BFF. 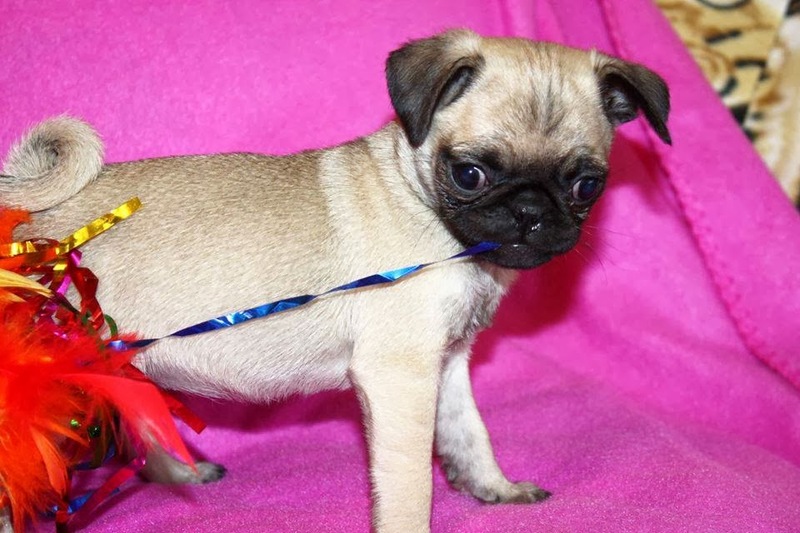 A woman named Lee Stevens of Harlee's Angels pet rescue stepped up and found Mushu, a Pug puppy. While getting ready for Mushu to meet Tiffany, Mushu was placed in foster care with a woman named Kristi Massin. This is where things take a downturn. According to Ms. Stevens, Ms. Massin now refuses to hand Mushu back to the rescue and in turn, over to Tiffany's family. When I inquired as to why Mushu was being withheld, Ms. Stevens and another individual informed me that Ms. Massin has personal issues with another individual involved in the rescue. Ms. Massin for her part, has proven quite difficult to get hold of. Hopefully she will read this and offer her side of the story. I can not imagine any personal issues being so large as to deny a very sick child. Today, Ms. Stevens formally laid charges for the return of Mushu. In the meantime? There is a very sick little girl caught in the middle of this mess. I thought I had seen it all before. Rescues fight with each other and often fight internally, but never, EVER have I seen such a disagreement explode to the point where a terminally ill child is the victim of such an issue. There should be no more arguing and no more excuses. Get this dog to this girl so she can have the merry Christmas she is dreaming of. So far I have only heard one side of this story. Ms. Stevens says she has done and will continue to do everything she can legally until Mushu finds his way into Tiffany's loving arms. I can only hope that whether she responds or not, Ms. Massin will agree and do everything in her immediate power to do the same. I will be updating this story as information becomes available. HAPPY NEW YEAR to Mushu & Tiffany!! 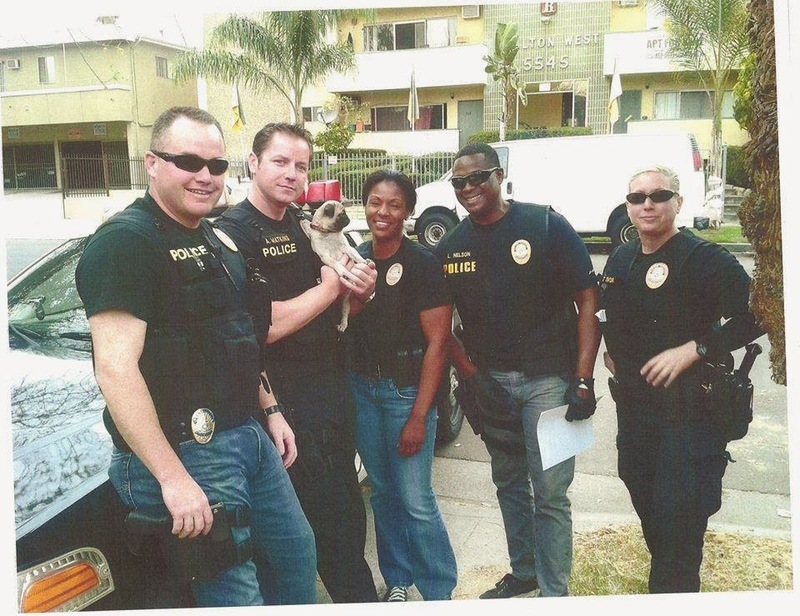 Yesterday 5 officers served a search warrant to retrieve Mushu from Ms. Massin, who was anything but compliant. In fact she threatened to have the officers arrested for lack of jurisdiction. On top of that, in a truly cowardly act Kristi Massin placed Mushu with a neighbour who had no idea of the circumstances surrounding the dognapping. Thankfully through excellent detective work and neighbours speaking out the officers were able to retrieve Mushu, who is now on her way to meet Tiffany! According to the officers, Ms. Massin was "cold hearted" and her actions "disgusting". Cheers to rescuers Shawna Hamon and Lee Stevens for their persistence, and to the Riverside police for acting so diligently. Here's wishing Mushu and Tiffany the happiest of new years together. This story just keeps taking very odd turns, and today's update is frightening. Recently Shawna Hamon, the rescuer who regained possession of Mushu, saw what she believed to be a mysterious man in a car watching her at home. Ms. Hamon notified the police, as the detective had previously told her if she in any way feared for her or Mushu's safety, she was to contact authorities immediately. When detectives arrived to her home they questioned the young man in the car, who informed them he was a private investigator hired by Ms. Massin to find Mushu. Within the car was a note detailing Ms. Hamon's name and address, as well as a description of Mushu reportedly provided by Ms. Massin. When asked for proper credentials the young man could not provide them. Currently the man has been charged by the state with misrepresenting himself to the police as well as stalking. Kristi Massin has also been charged. As more develops I will update, including when Mushu will be going to meet Tiffany, who has just finished a round of treatment and is waiting to get her energy back. Good luck sweet girl! I have been informed that Mushu and Tiffany are finally together! I requested in the hopes of getting a photo and/or statement from the family to share with you all but have been told that Ms. Hamon would like to put this ordeal behind her and move forward. Here's wishing Tiffany and Mushu many happy days together! !